Almost a fifth of England's state secondary schools do not yet meet the government's new "floor target" for GCSE attainment, league tables show. 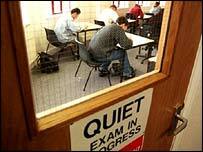 In 638 schools, less than 30% of pupils got five good GCSEs including English and maths, the target for 2012. But this was down from 789 schools last year and ministers say many more are on the verge of surpassing the standard. Independent schools and teacher unions have said the tables are misleading and distort the secondary curriculum. The tables show that nationally 46.7% of pupils at the end of their compulsory education attained the equivalent of a grade C or above in five GCSEs including English and maths. Girls continued to outperform boys in the exams they took last summer, with 51.2% of girls making the grade against 42.4% of boys. The best school at GCSE level was, as last year, Chelmsford County High School for Girls, a grammar school in Essex. Its 120 GCSE students all had at least five good GCSEs and their average points score of 748.2 equates to almost 13 A* grades for each girl. The worst was Parklands High School, a non-specialist comprehensive in Speke, Merseyside, where only 1% got five good grades with English and maths and the average points score was 217.4. The school where pupils made the most progress was Moreton Community School in Wolverhampton, a technology specialist, with a "contextual value added" score of 1090.5. This takes into account nine factors outside a school's control which are known to affect attainment, such as gender, first language and deprivation. In the A-level tables, the highest performing school was again Colchester Royal Grammar, with 1323.5 average points per student - equivalent to almost five A grades. Schools Minister Jim Knight said it was important that all schools keep improving, whatever their results. The 30% floor target for GCSEs - set by Prime Minister Gordon Brown - was a stepping stone for those in challenging circumstance to go even further, he said - not a stopping point. "But we owe it to parents to make sure low performing schools turn around quickly." He added: "We will be investigating options such as closure, federation or becoming part of our academy programme for those at the very bottom. Poor performance is not tolerated." Shadow children's secretary Michael Gove said: "Well over half a million children are in schools that Gordon Brown has said should be taken over or closed because they are failing." Liberal Democrat children's spokesman David Laws said the government was still failing millions of children by not guaranteeing them a decent education. "The government's target of having no school where more than 70% of children are failing to get these five good grades is hopelessly unambitious." Many famous independent schools appear to do badly because their pupils sit International GCSEs in English and maths - which are not recognised in the government tables. This year a new science indicator compounds the issue. This shows what proportion of pupils attained at least two good GCSEs in science subjects. But in schools which offer separate sciences - chemistry, biology and physics - pupils who opted to do only two were not counted. The chief executive of the Independent Schools Council, Jonathan Shephard, said: "These flawed and misleading tables are a travesty of fair reporting." 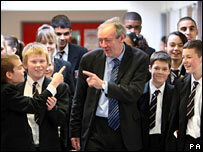 The general secretary of the Association of School and College Leaders, John Dunford, said the tables created "perverse incentives", making schools skew their curriculum for 14 and 15-year-olds to improve their position and to enter 18-year-olds for subjects needing less teaching in order to add to their points totals.